Suzanne McLees - A native Washingtonian and resident of the award-winning mid-century modern community in Alexandria, Virginia, Hollin Hills, Suzanne McLees is a passionate enthusiast for modern art and design. Formerly Northeast Area Manager of Design Within Reach (DWR), Suzanne opened DWR's first location in Washington, DC, in Cady's, Alley/Georgetown in 2004 and managed the Adams Morgan studio (now closed) from 2005-2007. She has lived in France and traveled to 26 countries. Although her current profession involves international health and development with travel to Africa, in her spare time, she actively pursues her interest in all things modern. Suzanne is Chair of the committee planning the April 28, 2012 Hollin Hills House and Garden Tour (for details, visit www.hollinhills.net and, on Facebook, Hollin Hills House and Garden Tour). Michael Shapiro - Michael Shapiro is founder of the popular local blog Modern Capital and is a Realtor with Long and Foster. 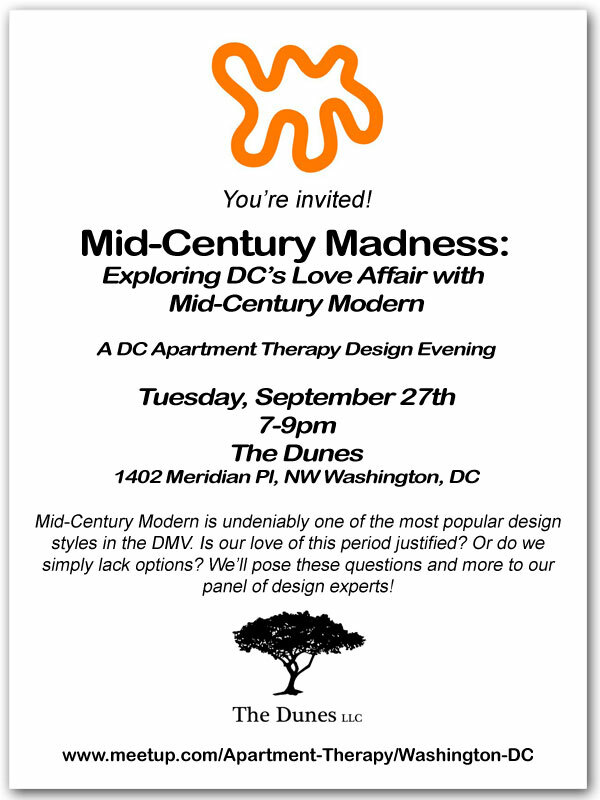 Modern Capital (moderncapitaldc.com), launched in the fall of 2006, is dedicated to covering mid-century modern and modern real estate, design and events in the D.C. area. It also is committed to raising awareness and supporting efforts to preserve mid-century modern architecture through donations to local and national preservation groups. Michael's passion for informing people about the variety of mid-century modern homes and neighborhoods in the area and an intense interest from readers looking for a real estate professional who understands and appreciates mid-century modern architecture, led him to pursue his real estate license. He is now licensed in Maryland, D.C. and Virginia focusing on helping people buy and sell mid-century modern homes. Robert Chapman - Robert Chapman is one of DC’s leading purveyors of mid-century modern furniture. Many of you know him from his years running Modernicus. He is now preparing to open his new store at Cady's Alley in Georgetown, ARCHER which aims to be an inspiring retail experience that highlights 20th Century design and fine art alongside a permanent collection of high quality modern furnishings for the home. A regular exhibition schedule of important designers from around the world ensures the continued dialog of good design. How do I get the best price for my mid-century furniture? That generation is downsizing or moving to assisted living, so there is probably a lot on the market -- but at least it is in demand.